The owner of this Grand Banks 42 Classic will be using a davit system for his dinghy. 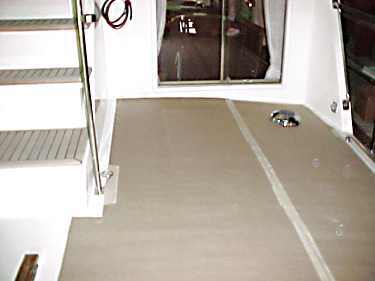 Since the space where the dinghy is usually stored will be empty, he decided to have a teak deck laid for a sun deck. 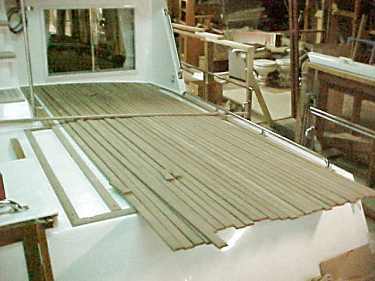 The first step the carpenter took was to lay off the area to see what the final deck would look like. This visualization gives him an idea of what obstacles will need to be accounted for and gives him an area to measure for material he will need. The next step was to mill all the material needed. He also laid the perimeter border which sets the lengths for all the planking and keeps everything in alignment. You can see that the vent in the previous photo has now been removed. 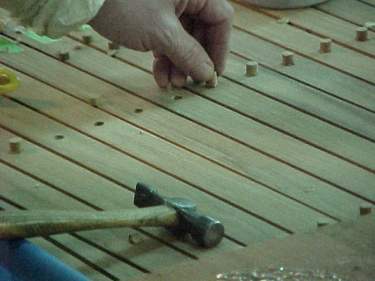 In the initial dry fit, rough cut planking is laid into place to check for sizing, to assure the grain patterns will be attractive and to be marked for cutting. The job is coming along here. 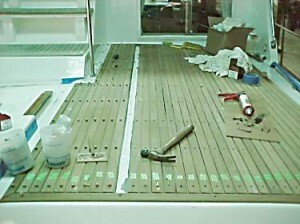 Most of the strips are bedded in place, the fasteners have been installed, and the plugs are being put in. All of the border is fastened down and the corners have been mitered. The plugs are all inserted and sanded flush. Then the deck seams will be filled and the whole deck area sanded. 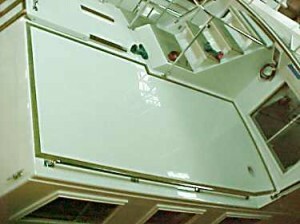 The result is a product that exactly matches the main teak decks.